The Hotel Mar De Cortez is another budget hotel in the heart of downtown Cabo San Lucas. 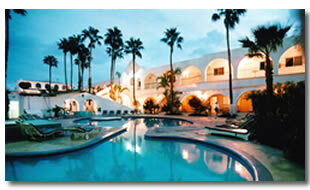 This hotel however is larger than the other budget hotels you'll come across in Cabo San Lucas. It has 90 rooms, and a much larger pool. We stayed here a couple of nights, and we could have stayed longer. The room rates start at $50 a night. A warning before hand this isn't the Hacienda, a week here is less than one night there so you only get what you pay for. If you plan on having a spring break 2007 then this is perfect. You're right next to the nightlife, I mean literally seconds away from Cabo Wabo. You'll have some good nights in there, and everywhere else. You don't get things like a tv or phone in your room. If you're here for a good time you wouldn't need them anyway. The staff at the Hotel Mar De Cortez are great which does seem to go with all of the budget hotels in Cabo San Lucas. 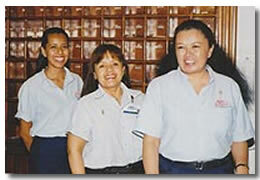 The ladies on the front desk have so much warmth, and go out of their way to help you. Nat gets a mention for being extremely helpful, even before we made our booking. She's based in the US, and is one of the reservation staff. The rooms are very basic, but you have to remember what the rate that you pay. 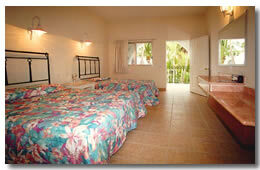 You get your bed which is quite firm as are most of the beds in Cabo San Lucas hotels. They must all buy them from the same manufacturer. You'll have a couple of towels hanging up which get changed daily along with your sheets. The Hotel Mar De Cortez pool is excellent for a dip. This sets this hotel off in terms of how much you pay to stay here. Usually with budget hotels you get a small pool but this isn't a bad size at all. It's not resort size but big enough, and it gets plenty of sun around it as well. Spring breakers will find this hotel more than fits their needs. And anyone who wants to be in the heart of downtown Cabo San Lucas, and is not bothered about not staying in a Hacienda style hotel.